A Saskatchewan researcher says many wetlands across the prairies are being contaminated by a relatively new pesticide that is threatening the ecosystem. Neonicotinoids are commonly used to control pests in western Canadian canola fields. A University of Saskatchewan biologist says many wetlands across the Prairies are being contaminated by a relatively new pesticide that is threatening the ecosystem. Christy Morrissey says that over the past few years neonicotinoids have been used increasingly on crops in Western Canada and the chemical is making its way into wetlands, potentially having a devastating "domino effect" on insects and the birds that rely on them. Morrissey is just a year and a half into a four-year study, but she's alarmed by what she's finding. "This is huge" Morrissey said. "The impact on biodiversity could be probably bigger than we've ever seen before if we keep going at this rate." Neonics, as they're commonly called, hit the market in the early 2000s, but sales have taken off over the past five years. They're used on a wide variety of crops such as corn, soybeans, wheat, oats, barley, potatoes and fruit. In Western Canada, neonics are most commonly found on canola. 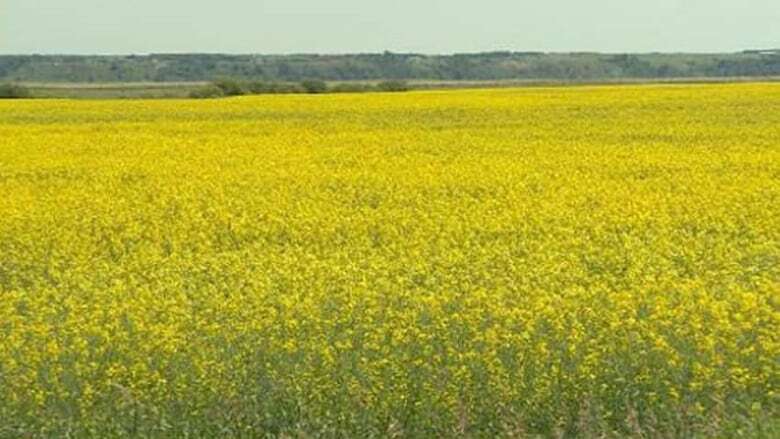 Virtually all of the 8.5 million hectares of canola planted in Saskatchewan, Manitoba and Alberta are now treated with them. Based on confidential data obtained from the federal government, Morrissey said her conservative estimate is 44 per cent of crop land in the Prairies was treated with neonics in the year she reviewed. "We're not talking about a little regional problem. We're talking about something that's happening over tens of millions of acres." Morrissey said her study is the first in Canada looking at how the widespread use of this chemical may be affecting wetlands across the Prairies. Her research has found the chemical is commonly showing up in wetlands in concentrations at least three to four times higher than what has been deemed habitable for insects. "In some cases we have peak concentrations that are 100 times or more higher than those benchmarks of safe levels." Morrissey said. 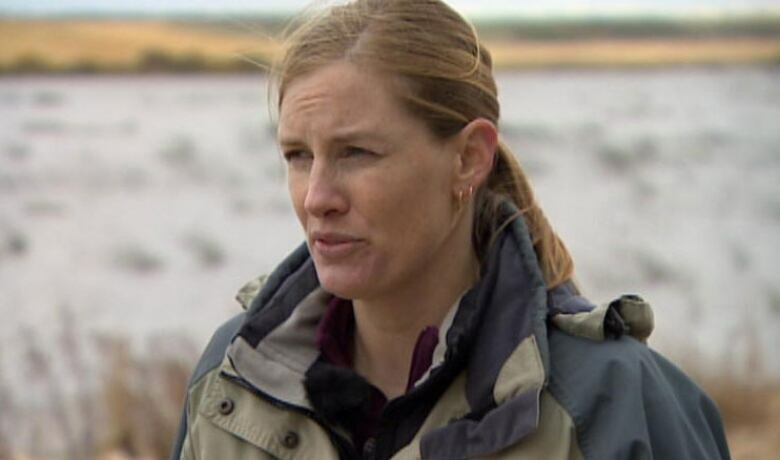 She and her fellow researchers have sampled hundreds of wetlands and have found that "upwards of 80 to 90 per cent of the wetlands are contaminated." Most alarming, she said, is that the chemical was detected in the water before farmers planted in the spring. Morrissey said her research shows neonics are persisting in the water for months and in some cases years. She said that is likely to be devastating to insects. "The longer that the chemical is in the water the longer the exposure time for the bugs. So they basically are being hit continuously with the chemical." Morrissey said preliminary data suggests just what she suspected: an apparent decline in mosquito and midge populations, which could have serious ramifications for birds. "So birds that are flying around, they are primarily eating midges and mosquitos," Morrissey said. "The ducks in the ponds, they are reliant on the midges, for example. So we know that these insects are basically the food supply for a lot of wildlife." Neonicotinoids have been blamed for declines in bee populations. Morrissey said there's plenty of evidence to show bird and insect populations are declining, but she acknowledges it's not yet clear if neonicotinoids are playing any role. Morrissey said she's attempting to learn how all of these pieces fit together. "It's forensics, really, to see whether or not this one is causing the other. That takes a considerable amount of careful experimentation." She said she's approaching this work with a real sense of urgency, because of how quickly neonics have become the pesticide of choice. "We all want to have food that we consume and enjoy. But at what cost?" Morrissey wonders. "Is that at the cost of having no more birds around? Of having no more butterflies? Having no bees? People are thinking about that now." Morrissey isn't alone in her concerns. In March 2013, American Bird Conservancy published a paper citing data from Canada, California and the Netherlands claiming "that concentrations of several of the neonicotinoid insecticides are high enough to be causing impacts in aquatic food chains." The paper is titled "The Impact of the Nation's Most Widely Used Insecticides on Birds." 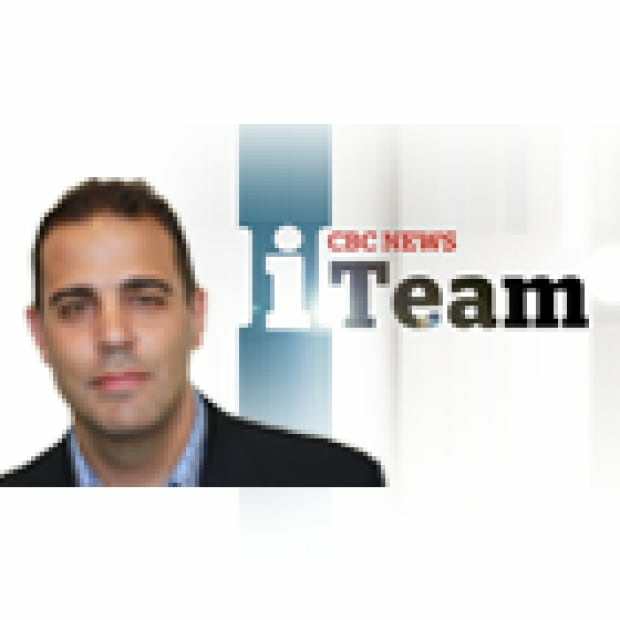 It was written by Pierre Mineau, a former senior research scientist specializing in pesticide ecotoxicology with Environment Canada, and an adjunct professor at Carleton University and the University of Saskatchewan. The paper refers to Morrissey's research and other findings that led Mineau to conclude "it is clear that we are witnessing contamination of the aquatic environment at levels that will affect aquatic food chains. This has a potential to affect consumers of those aquatic resources, be they birds, fish or amphibians." Mineau criticizes the U.S. Environmental Protection Agency for its continued approval of new neonicotinoids for use in that country. "EPA risk assessments have greatly underestimated this risk, using scientifically unsound, outdated methodology that has more to do with a game of chance than with a rigorous scientific process." Mineau said concerns about neonics have now led the American Bird Conservancy and partners in the National Pesticide Reform coalition to urge the EPA to ban the use of neonics as seed treatments and do a thorough review of their effects on the ecosystem. Despite these concerns, there is not unanimity in the scientific community regarding the reasons behind declining bird and insect populations. Another study by Mineau points out that "most investigators have blamed farmland bird declines on some aspect of agricultural intensification." In other words, declining bird populations could be explained by farms that are larger and more dense than in the past, and as a result wildlife is losing its previous habitat. Other scientists blame the decline on increased predation, which they argue is also a consequence of changes in habitat. The companies that manufacture neonicotinoids, Bayer CropScience and Syngenta, say their products have been rigorously tested and were found to be safe before they were introduced into the market. CropLife Canada is an industry group that speaks on behalf of those companies. It said there's no reason to believe that neonics persist in water over long periods of time. "The companies have done studies in Europe and in North America where they've applied the product consecutively for 10 years and have seen no accumulation, no bioaccumulation." explained CropLife Canada's Pierre Petelle. "And they've also seen no persistence beyond the levels that you would expect in a field for one year." And so, while he hasn't yet seen Morrissey's data, he's quite sure, based on previous research, that it won't identify significant concerns with neonics. "We're confident that the levels that would be detected under normal use won't pose a problem. So we would love to discuss these data with the researchers." Petelle said that neonics, far from causing harm, are a welcome replacement to older sprayed-on pesticides that were potentially harmful to humans and animals. "This class of insecticide [neonicotiniods] had extremely low toxicity to humans, extremely low toxicity to other mammals as well as birds and fish." Petelle said the coated seeds make a lot of sense because they do away with the possibility of overspray and allow farmers to avoid multiple applications of pesticides throughout the growing season. But Morrissey said that it's still quite possible farmers are applying more chemical to their fields now, using these treated seeds. "Obviously the disadvantage from an environmental perspective is that every single plant is treated whether it needs it or not." said Morrissey. "So now you have a situation where large tracts of land are basically treated when they may or may not need to be treated." Until now, neonics have primarily raised environmental concerns because of their perceived effect on bees. In April of last year the European Union placed a two-year trial ban on the chemical because of complaints from beekeepers about dramatically declining populations, and scientific evidence that may show neonics are partly to blame. CropLife Canada said the ban was a reaction to overheated rhetoric. "The problem here is that now you've got activist groups who've got a very clear anti-pesticide perspective and they don't hide that," Petelle said. "And it's unfortunate." He said there's no unambiguous evidence to suggest that neonics are to blame for the decline in bee populations. Unlike Europe, which has moved to ban neonics, the Canadian government said in an email to CBC "we do not feel a suspension is warranted at this time." However, Health Canada's Pest Management Regulatory Authority has publicly raised concerns about the pesticide, and its possible effect on bees in the corn-growing regions of Ontario, Quebec and Manitoba. In the statement, Health Canada said its research shows "the use of neonicotinoid treated corn and soybean seed are affecting the environment due to their impact on bees and other pollinators." 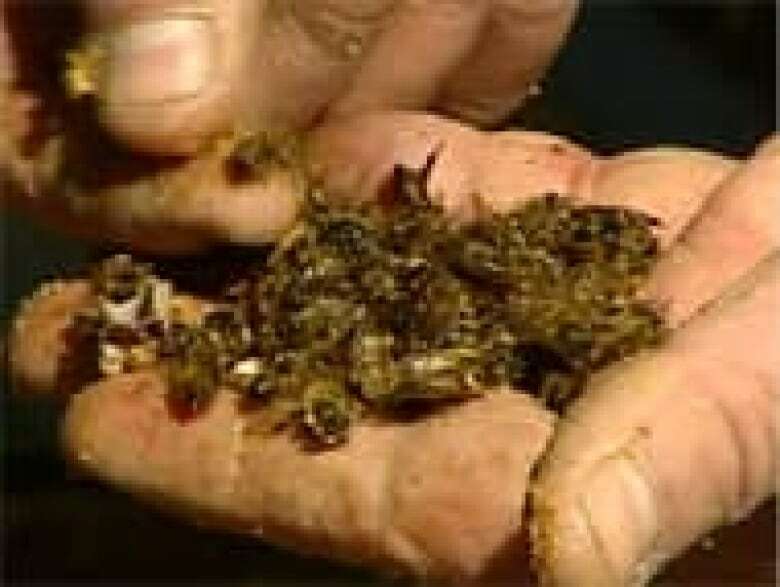 It found that about 70 per cent of dead bee samples tested positive for neonic residue, whereas the chemical was detected in one sample of unaffected bees. "We concluded that the majority of pollinator mortalities were a result of exposure to neonicotinoid insecticides" the report said. And so Ottawa is now publicly consulting on new proposed standards for safer planting practices and enhanced warning labels on soybean and corn seed treated with the pesticide. It is also conducting a detailed scientific re-evaluation of the effects of neonics on bees, which will be released this year. While not commenting directly on Morrissey's research, Health Canada does say that "the overall potential effects of neonicotinoid insecticides to Canada's ecosystem are one of the topics that will be examined as part of the broader re-evaluation, which is currently underway."